Five days from high school graduation, Ashley Easterbrook went out for ice cream with friends. When she didn’t come back, her dad got worried and called troy police. It’s been 17 years since Ashley was killed by a drunk driver at the intersection of Crooks and Long Lake roads. “They said a young lady matching the description of your daughter was in that crash,” Easterbrook said. “And so I asked what hospital is she in. He said she is not in a hospital. She, two others in her car and a 33-year old drunk driver all died in a crash. Hauntingly, Ashley almost sensed her death coming. 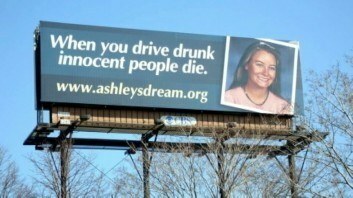 The family fueled by her message before her death, deciding to create AshleysDream.org. “Our foundation, we also reach out to kids, we reach out to schools, we speak around the country, my son and I about the dangers of drunk driving,” Easterbrook said. And recently they’ve seen progress. The sign “Drunk driving – you can’t afford it” sign was put at the Crooks and Long Lake intersection by the Easterbrook family. In fact anywhere you see a sign like that in Michigan, you’ll know someone died at the hands of a drunk driver. Easterbrook credits awareness for real results. Ashley’s Dream also helps young people do something Ashley never had a chance to do – attend college. About $500,000 was given out to 135 teens since the foundation was created. “We want to see fresh new ideas and what can we do, and what can they do to spread the word,” Easterbrook said.